It is early September, and the humanitarian aid community in Bangui, capital of the Central African Republic (CAR), is fearing the worst. The Ebola outbreak in neighboring Democratic Republic of the Congo is intensifying, and there is a chance the epidemic may jump the border into a remote area of the CAR, an area under the control of armed groups. One Thursday morning, some jumbled information from there reaches the capital. There are people bleeding. Hemorrhaging. It might be Ebola. As in most of the rest of the country, there is no government presence in the CAR’s far east. Periodic violence means there are no international organizations either. There is no health system, no reliable communications network, no way to know whether the information is accurate without dispatching a helicopter loaded with heavily armed peacekeepers at much expense and great risk. These days, five years into the civil war, calling the CAR a country is a bit of a stretch. There is a flag, sure, and a national anthem and borders, but what happens inside those borders is not regulated by anything resembling a traditional state. The government, propped up in Bangui by a phalanx of UN peacekeepers, controls only small swaths of territory around the capital and to the west. The rest of the country is divided between more than a dozen armed groups whose identities, allegiances, and territories are constantly shifting—so much so that by the time peace talks are organized, some of the groups represented no longer exist and new ones have emerged that are not represented. Sometimes it seems as if the armed groups themselves are not entirely sure what they are fighting about. Often the violence is cloaked in the language of religion—the good Christian soldiers waging war against the terrorists, or the persecuted Muslims protecting their ravaged minority—but more often than not the fighting is about control of increasingly scant resources, such as food and cattle. Bangui is full of men in uniform. Peacekeepers in their distinctive light-blue helmets, soldiers in threadbare fatigues and red berets, the navy-clad gendarmerie. The rebels in the city, holed up mostly in the Muslim quarter, tend to keep a lower profile. 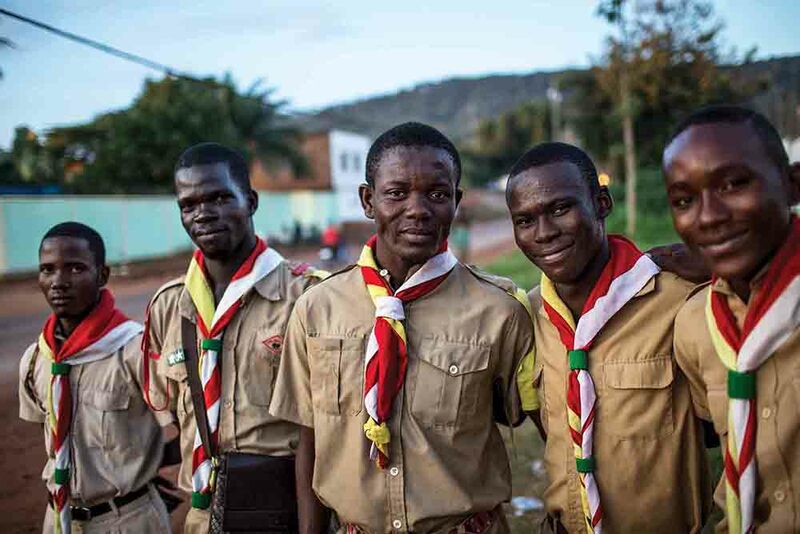 Also in uniform are members of the various branches of the Central African Boy Scouts movement. They look familiar, with their short-sleeve khaki shirts and shorts, long socks, and neatly tied neckerchiefs, and can often be spotted strolling in small groups along the capital’s leafy streets. Look carefully and you can see the merit badges on their sleeves: for woodwork, for cooking, for navigating. There are a lot of Scouts in the CAR—about 20,000, according to Scout leaders, but the conflict makes it difficult to be precise about this or any other statistic (by contrast, there are 14,787 UN peacekeepers). The Scouts are represented in all 16 provinces and in almost every church diocese. This makes the Scout movement larger in size and national footprint than any single armed group. Because of its rigid hierarchical structure, it has survived the onslaught of the civil war and is one of only a handful of national institutions—the Catholic Church is another—about which it is reasonable to assume that a decision made in Bangui can be implemented elsewhere in the country. The same cannot be said for any government ministry. In the 1920s, Baptist missionaries at Yakusu in the Belgian Congo tried to substitute Scouting for secret male initiation ceremonies, which they considered morally unacceptable, while Roman Catholic missionary educators sought to use the movement to train ‘Christian knights,’ who would assist them in converting the wider African population in the colony. Across the Congo River in Brazzaville, French authorities similarly expected Scouting to train a moral African elite that would exert a positive influence on the rest of colonial society. “At the national level, we have contributed to the development of our country. 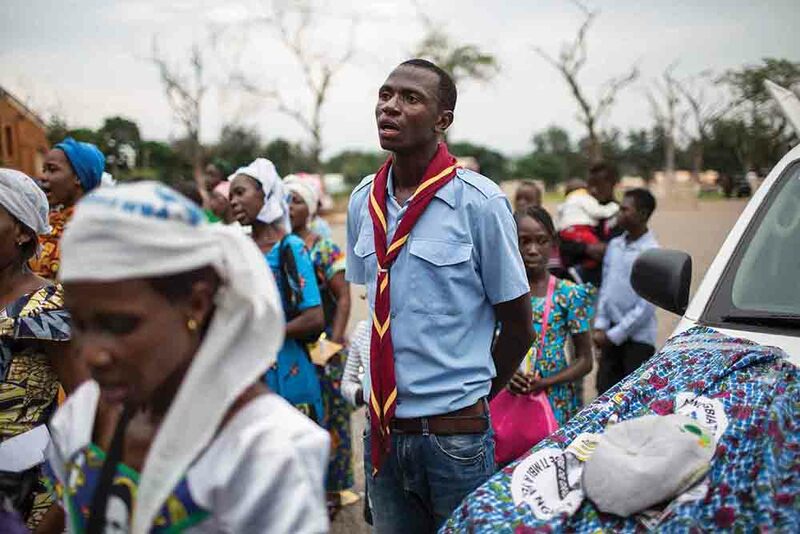 We are warriors of peace,” says Rony Yannick Bengai, the secretary general of the Catholic Scouts Association, by far the largest of the various Scout groups. Like so much else here, the movement is divided along religious lines: there are also the Evangelical Scouts, known as Les Flambeaux, and a dwindling group of Muslim Scouts. Bengai became a Scout at age seven and has been involved with the Scouts in some form for 22 years. He’s now 29. For him it has been a lifeline. “Scouts taught me how to live in a community, to develop moral, intellectual, and physical capacity,” he says. He and his peers rattle off a list of accomplishments that makes it clear the Scout movement in this country is not just a recreational activity. Some representative examples: when the UN Children’s Fund wanted to roll out a nationwide vaccination program, it was the Boy Scouts who knocked on village doors to tell skeptical citizens that the doctors were coming and they could be trusted. When nervous villagers need to go to a hospital in a distant town, they can request a Scout to accompany them along unfamiliar roads and territory. 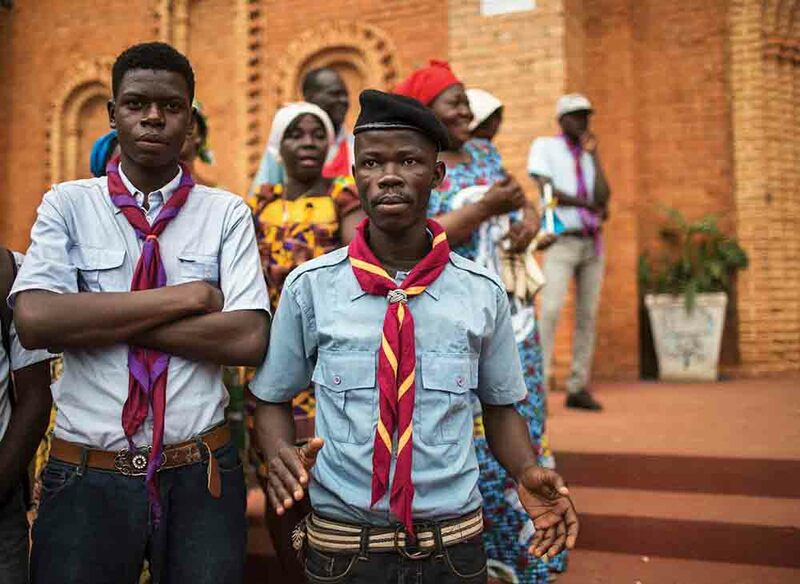 When a Muslim community was held hostage in the forest near Boda in 2017, it was the Scouts who mediated with the armed groups holding them to secure their release. When Pope Francis came to visit in 2015, it was the Scouts who managed the delirious crowds that lined his route from the airport. 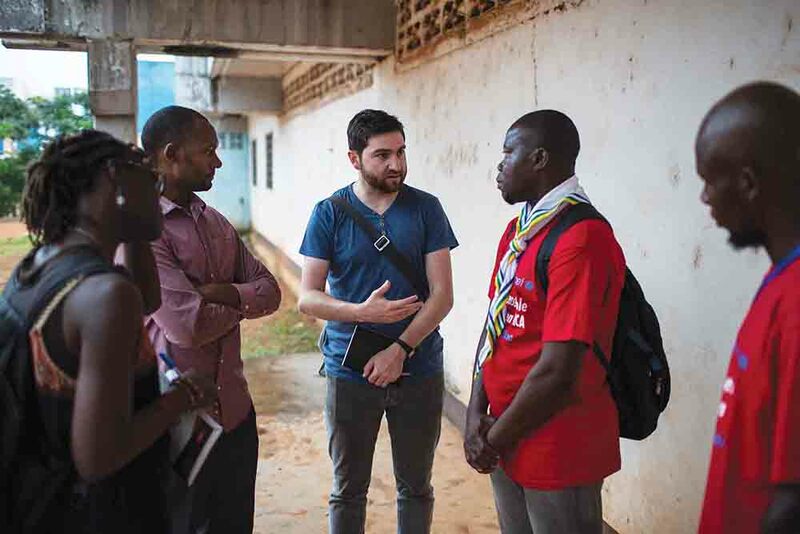 And this year, when humanitarian aid workers received those jumbled reports about a potential Ebola outbreak in a remote, treacherous part of the country, it was the Scouts who were consulted as the first line of inquiry. Scouts were already there, of course. Fortunately for all concerned, there was no sign of the deadly virus. Ngoaporo Ghislain-Oxwold, 17, and Boy-Fini Mikael, 18, are friends. At first they were not sure about this Scouts business—it looked like hard work and not especially cool. But slowly they came around as more and more of their friends joined, and everyone seemed to be having a great time. “We used to stay in the neighborhood and do nothing. Then our friends who were Scouts were going every Saturday. They said it was really interesting, really fun. They did activities. Singing, dancing. Sometimes there were shows,” says Ghislain-Oxwold, speaking in the rain falling outside the Bangui basketball stadium, where his troop is involved in a talent show designed to showcase the best of the city’s singing and dancing. In the Scout movement’s rigid, pseudomilitary hierarchy, the two friends are explorers, the entry-level rank, but have set their sights on moving up the ladder soon. They have already attended the mandatory two-week initiation camp, at which they learned basic survival skills, such as how to find shelter and start a fire. They are also taught several skills traditionally considered to be “girls’ work”: laundry, washing up, and cooking. It seems to be working. 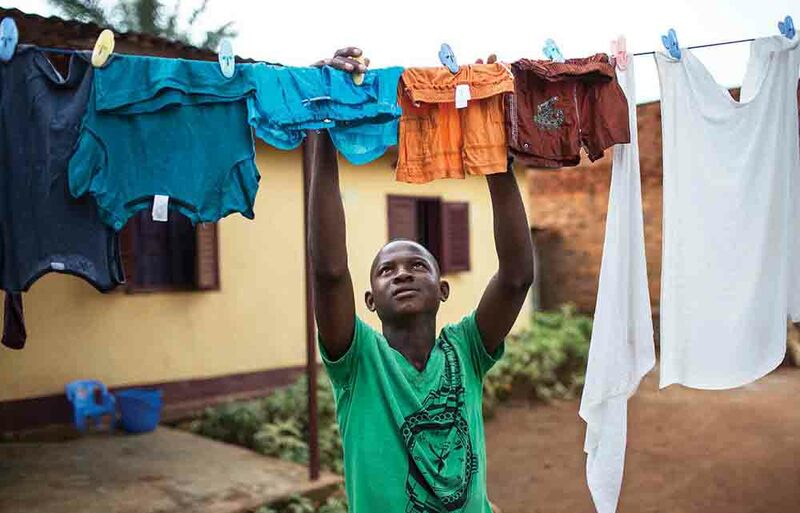 Later, at Ghislain-Oxwold’s house, he neatly hangs his family’s clothes on the washing line. Not all their friends are Scouts. Others have joined armed groups, and the attraction is much the same. Like Scouts, armed groups provide a powerful sense of purpose and belonging. Even their training camps are not dissimilar in terms of the type of skills taught to new recruits, with one major exception: the Scouts don’t teach their members how to handle weapons. For all its militaristic trappings, the Scout movement in the CAR and around the world is explicitly pacifist, a legacy of the disgust Baden-Powell felt toward the atrocities committed during World War I. In the context of a civil war, however, preaching pacifism can be a revolutionary act, and it’s not always popular. 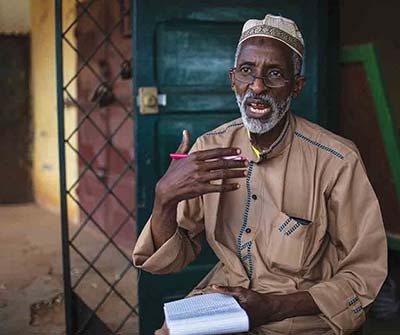 Ali Ousman is the coordinator of Bangui’s main Muslim civil society coalition. He lives, as all the Muslims in the city do, in an area called Point Kilometre Cinq, or PK5, so named because it is exactly five kilometers from the city center. Most of the country’s Muslim population has been squeezed into the boundaries of what is effectively a ghetto. PK5 is a dangerous place. Several armed groups operate inside it, and there are periodic clashes between them and the supposedly Christian militias. UN peacekeepers warily watch the roads leading in and out but rarely dare to venture in. Most PK5 residents believe the only reason the Muslim population has not already been wiped out is because they are protected by armed groups. Since the beginning of the civil war, thousands of Muslims have been killed, many in targeted killings. Many more have fled to neighboring countries. In contrast, the Boy Scouts, in their faintly ridiculous shorts and long socks, are choosing not to defend their community. “In reality, the Muslim Scouts don’t do anything,” Ousman says. He doesn’t use the word coward, but he doesn’t have to. He’s made his point. Several years ago, the Boy Scouts of the CAR were suspended from the World Organization of the Scout Movement. They had not paid their fees. Negotiations are ongoing to rejoin the global body, which has been mightily impressed by the efforts of its Central African chapter. There are obstacles to overcome before the CAR’s Scouts are returned to the fold. The fees are still a problem. So is the fractured nature of the CAR’s Scout movement: the Catholic Scouts, the Muslim Scouts, and Les Flambeaux should fall under a single umbrella. More serious still is that the Scout movement in the CAR has, until recently, treated Scouting as a boys-only endeavor. To participate internationally, the CAR needs Girl Scouts too. He doesn’t sound all that convinced himself. Nonetheless, a Girl Scout troop has been founded in Bangui, and about 50 young women have joined. Many of them are performing in a talent show. This is a welcome development, given that girls in Bangui, and even more so in the rest of the country, have fewer options than boys for employment and recreation. Rejoining the world Scouts would be an affirmation of the pivotal role the Boy Scouts have played in the CAR and would allow the movement to get more funding and partnerships to increase the scale of its work. An argument could be made that the Scouts should be receiving more funding anyway, given how valuable their work continues to be. To really understand that value, and despite what critics like Ousman might say, imagine if the Scout movement did not exist in the CAR. Imagine that those 20,000 boys were not going on camping trips and earning merit badges and telling remote villages about vaccination drives. What would they be doing? What groups would they join instead? Imagine that those boys were wearing different uniforms, ones that came with guns and struck fear into the hearts of people. Simon Allison is the Africa editor for the Mail & Guardian. He is also a research consultant for the Institute for Security Studies and a contributor to the Guardian, Newsweek, and Foreign Policy. Will Baxter is a photographer and writer whose work focuses on conflict, climate change, and human rights. His work has appeared in Newsweek, Marie Claire, Der Spiegel, The Wall Street Journal, The Sunday Times, Al Jazeera, Internazionale, and other outlets. Additional reporting by Amy Niang, senior lecturer in international relations at the University of the Witwatersrand in Johannesburg, South Africa, and Moussa Abdoulaye, a human rights advocate originally from CAR. The Stanley Foundation’s media programming supports quality, in-depth, and timely reporting on topics related to the foundation’s three issue areas: climate change, nuclear weapons policy, and the prevention of mass violence and atrocities. This story originally ran in South Africa’s Mail & Guardian newspaper. It was written as part of Uncovering Security, a media skills development program run by the Stanley Foundation, Thomson Reuters Foundation, and the Gerda Henkel Stiftung. A follow-up examining the consequences of state collapse in the Central African Republic by Amy Niang will be published in the next edition of Courier.